There’s not much that a red-tailed hawk (Buteo jamaicensis) needs to fear. At the top of the food chain, the birds can hunt animals twice their weight and can reach diving speeds of up to 120 miles per hour. Their visual acuity is easily five times better than ours, and they can even see ultraviolet light. There’s not much that they need to fear — except buildings. 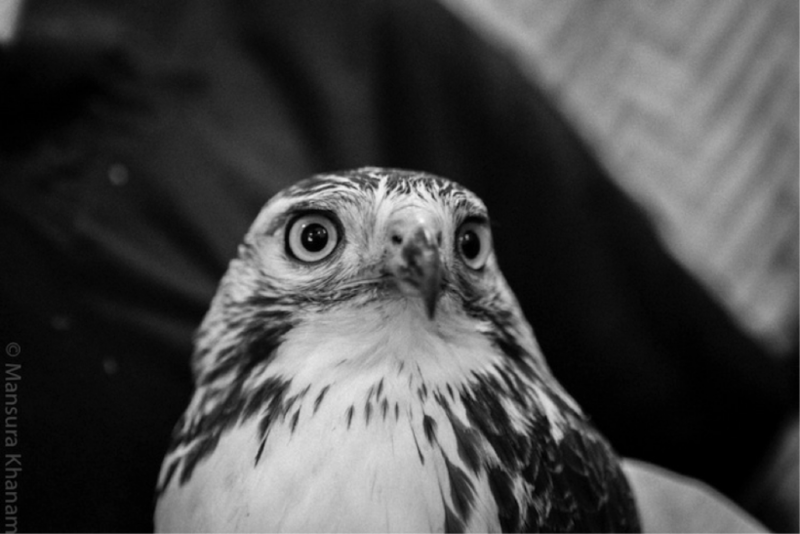 One evening last December, two men who were on their way to dinner noticed a juvenile red-tailed hawk lying on the sidewalk outside Penn Station. Two hours later, as the men tipsily made their way home, the hawk was still there — no one had picked him up. 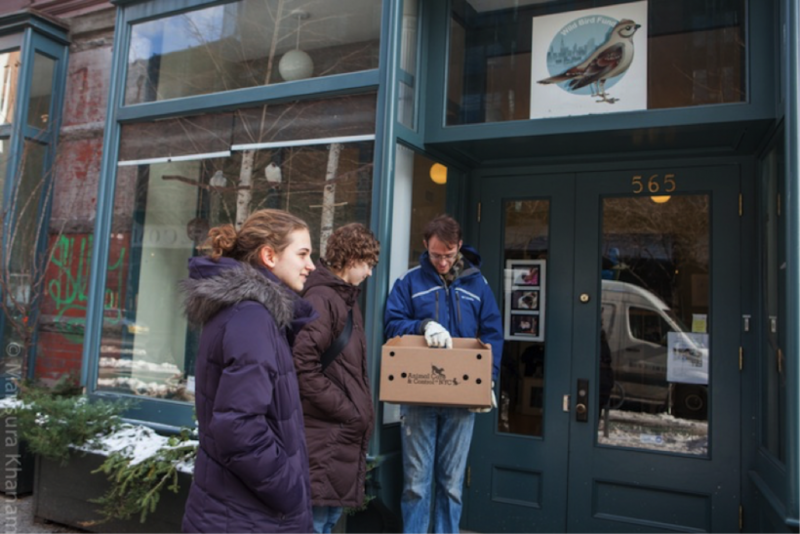 They brought him to the Wild Bird Fund Center. His eyes were closed, he was bleeding from the mouth, mostly from the sinuses, and he was unable to stand. His injuries pointed to head trauma, most likely caused by a high-speed collision with a glass window on the building above the station. The bird was given vitamin K injections to stop internal bleeding and placed in a warm, dark enclosure to recover. At first, he simply lay still, and we worried that he would not be able to survive his injuries. But with subcutaneous fluids and rest, the next day he was lifting his head and making eye contact, and on the next, standing and flapping his wings. We put him on solid food. We had to hand-feed him in the beginning, but he soon became a big fan of defrosted mice and would charge the door of his cage when we brought his meals, which he had no problem eating on his own. In ten days, he gained one third of his initial body weight. 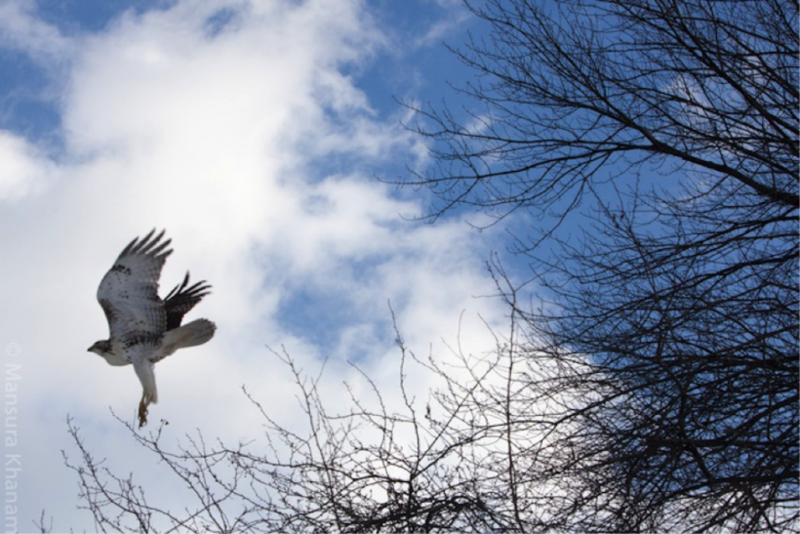 The red-tail also recovered from his head trauma, and his vision, which he relied on for hunting, had not been permanently damaged. He could be released back into the wild. 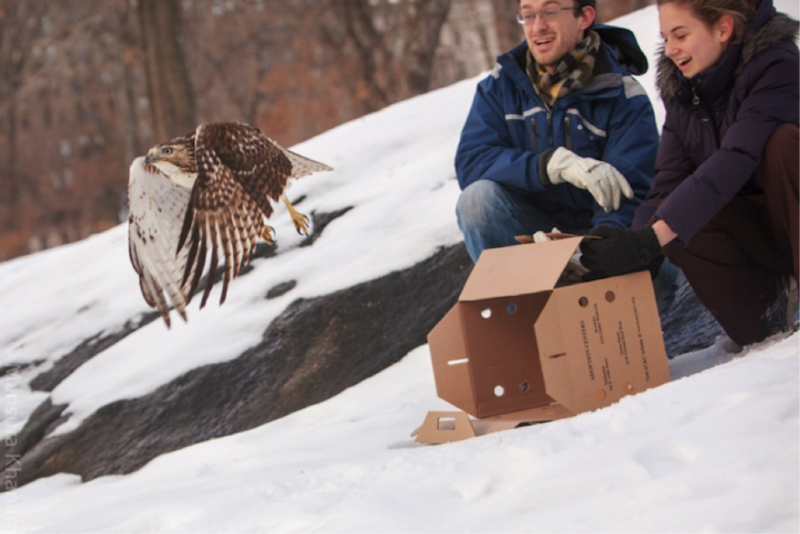 A pair of red-tails were circling over Central Park the day we brought our hawk out to the release site. 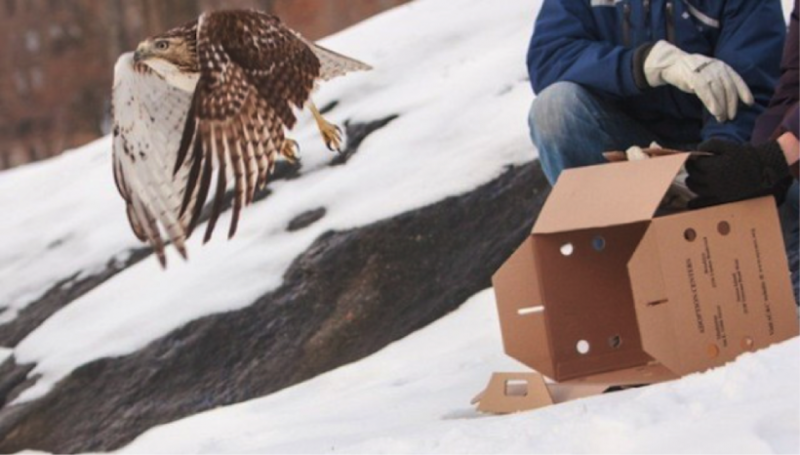 We opened the box on a small hill far from the other hawks, which tend to be territorial, and waited as our patient looked out over the wide expanse. A park vehicle rumbled by. We waited. The distant din of the city streets rose and fell. We waited. He looked around some more. We waited. Finally, with a hesitant glance behind him, he lifted his wings and disappeared into the cover of the trees.